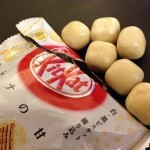 Review: Kit Kat Big Little Adult White Chocolate | Oyatsu Break! Given the infinite variety of the Japanese combini, you’d think I’d be big enough to not hold the White Chocolate Kit Kats in utter contempt, for their ability to sit on store shelves where other, more interesting flavours might end up. You’d be wrong. They cleared some of them off the shelves when they released the phenomenal Adult Raspberry last year, but somehow Adult White Chocolate and Adult Dark Chocolate have become fixtures alongside the standard Kit Kat, consistently successful and available in a way that even Japanese sweets flavour Green Tea is not. 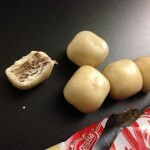 Worse still, there are now multiple iterations of White Chocolate Kit Kats on store shelves, mini’s and regular sizes and these Kit Kat Big Little’s, essentially a ball of Kit Kat, for some reason. The Kit Kat Big Little’s do get exciting flavours onto shelves where they might not otherwise–I think I bought an orange flavour in Japan that I can’t find now–but for the most part it just seems to be exactly the same as the flavours already available. 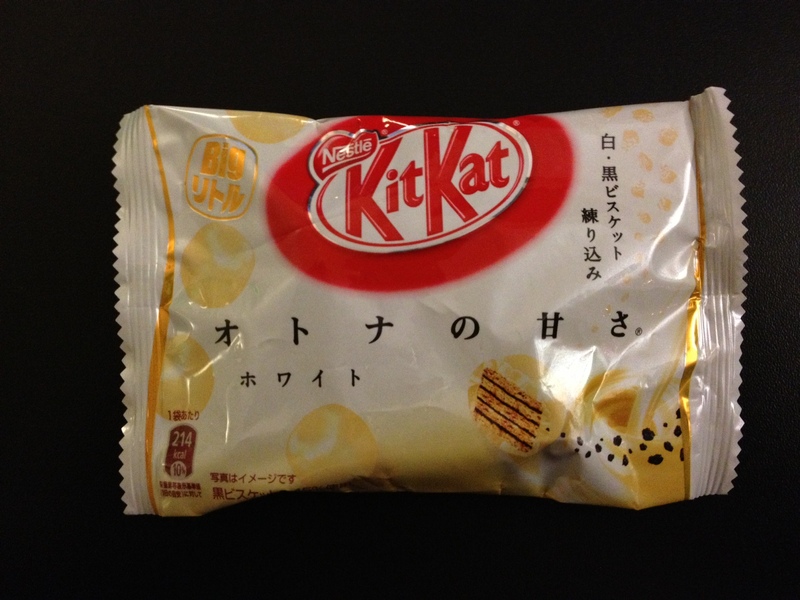 Packaging: The packaging is to Kit Kat’s usual high standard, with a large bright logo, clear imagery of the ingredients, and of the product itself. 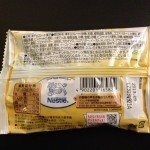 There’s no English on the package, but the printing on the silver foil packaging is well-done and quite eye-catching. There’s some lovely use of transparencies to create gold accents, and to give the front of the package a nice shimmer. Really, Kit Kat’s production and design folks deserve some sort of award. 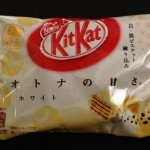 Scent and Taste: The only scent is of Kit Kat’s standard White Chocolate, which is disappointing. I was kind of hoping some of the chocolate/cookie might come through. The website and packaging seems to promote the high-quality Hokkaido milk involved, but it doesn’t smell like any Japanese milk candy I’ve had. The taste of the Big Little Bite is a bit more complex than a standard white chocolate bar, thanks to something milky in the white chocolate, and the chocolate cookie crumble is nice, but ultimately these little bits are pretty boring, and perhaps surprisingly bland stuff. Worse still, these are essentially ‘cubes’ of wafer that would normally be in a Kit Kat, but because they’re coated on all sides with the white chocolate, the balance is completely off, creating a one-note sweetness that overpowers the other flavours. I know, I know. I knew going in that I probably wouldn’t like these, but I’d never tried them and thought it was worth a shot. 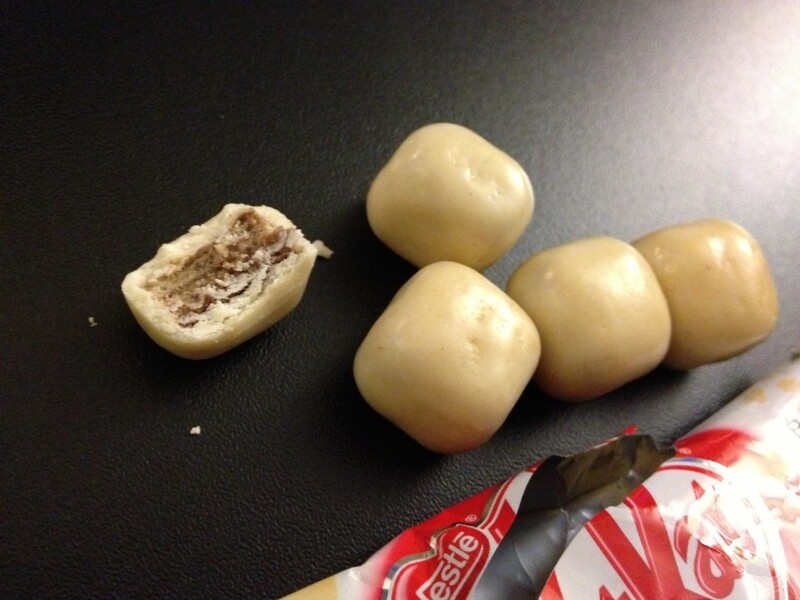 It’s not as badly put together as the Air-In Kit Kats which were just gross, but it’s worse than even the standard Adult White Chocolate Kit Kat. I’ve learned my lesson though, no more second chances on this flavour, and I’ll continue to hate it every time I see it on the shelves.